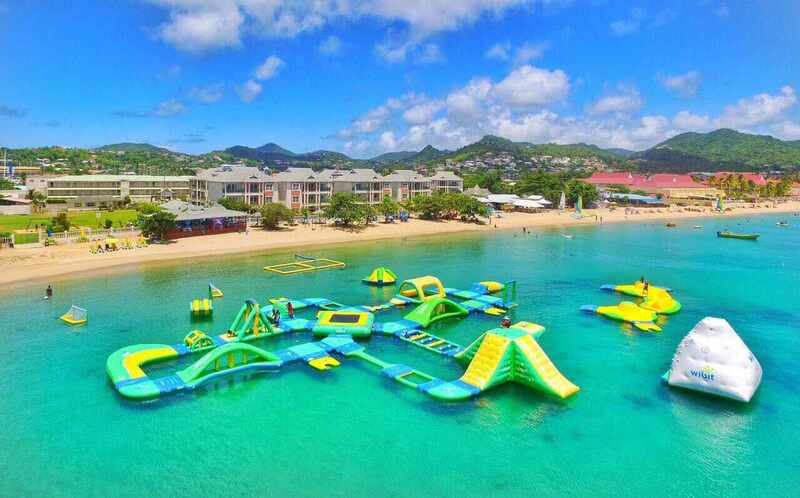 Splash Island Water Park Saint Lucia, the Ultimate Aquatic Playground is located on the Northwest coast of Saint Lucia, on the popular Reduit Beach. 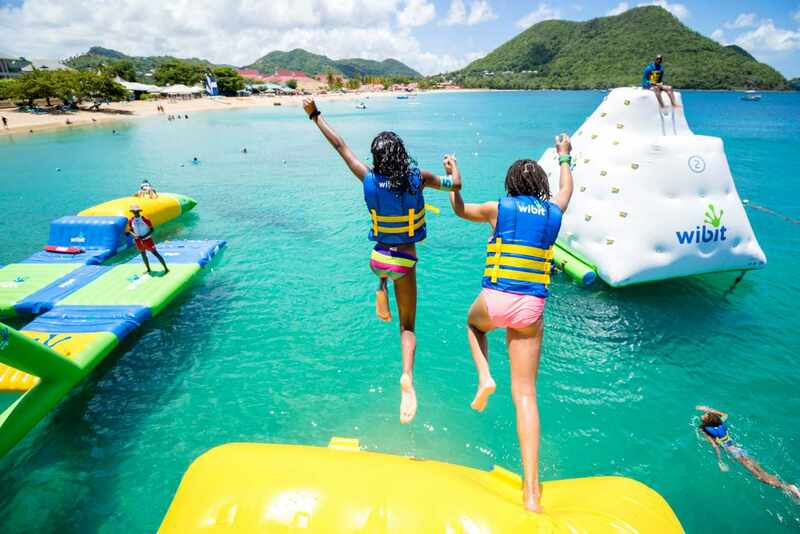 Splash Island is the Caribbean’s first open-water Sports Park opened in August 2015 and is minutes away from the multi-award-winning Bay Gardens Beach Resort & Spa located in Rodney Bay Village, Gros Islet, Saint Lucia. 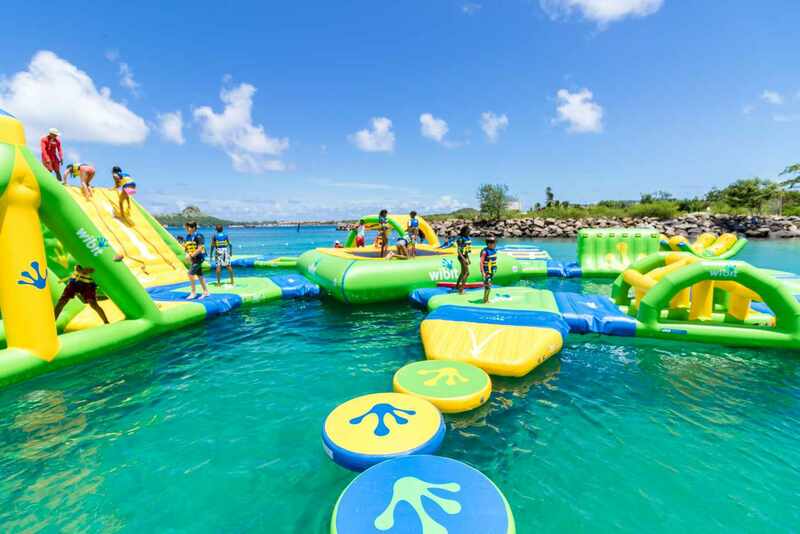 This inflatable water park manufactured by Wibit Sports GmBH, a German watersports company who has been producing commercial grade inflatable water sports products for over 18 years. 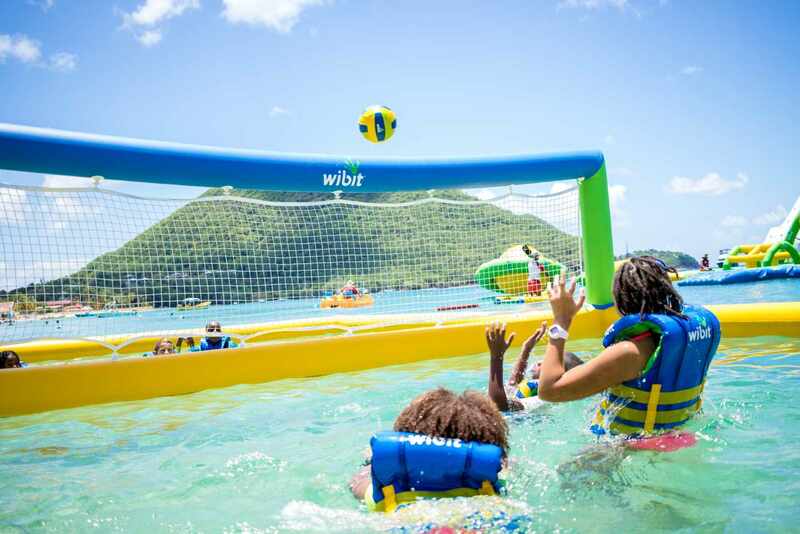 Wibit products can be found in over 200 locations around the world, but Splash Island is the first in the Eastern Caribbean. 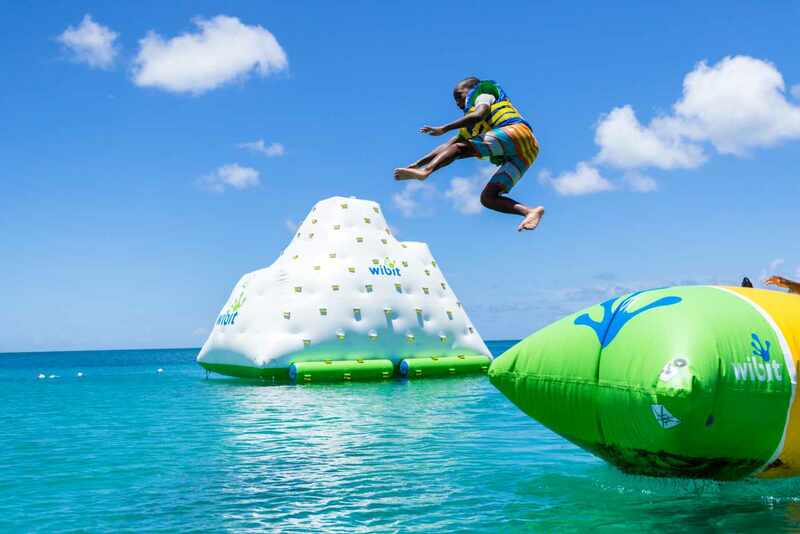 Kids, families and weekend warriors alike will delight in this Caribbean water park with over twenty-one (21) obstacle-course style features. 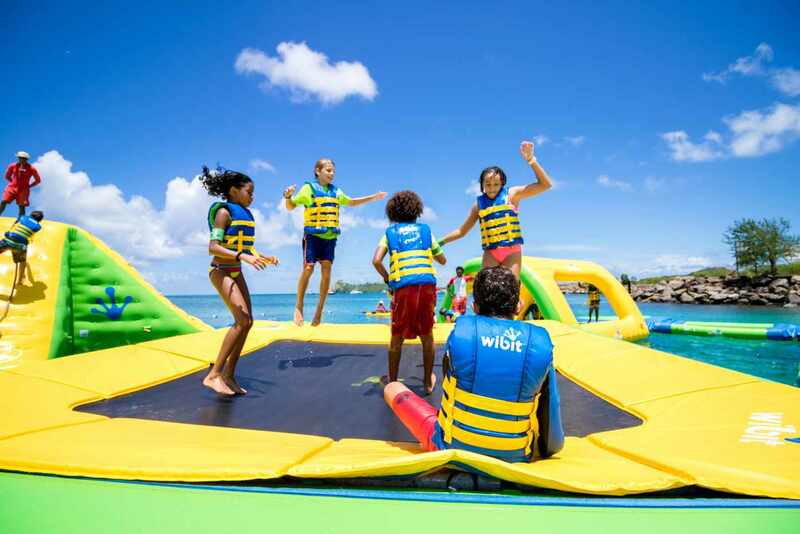 They range from a trampoline, climbing wall, monkey bars, swing, slide, hurdles, double rocker, flip, water polo, high jump, rodeo splash, Iceberg, action tower, the curve, balance beam, high roller and water volleyball to name a few. 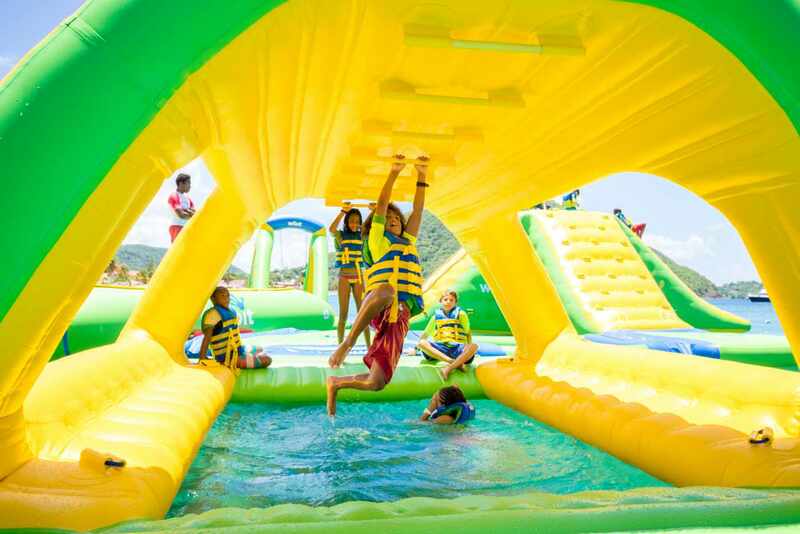 The water park is in compliance with the strictest of European safety requirements (EN 15649) and testing related to materials and performance. The Water Park is staffed by a team of certified lifeguards. 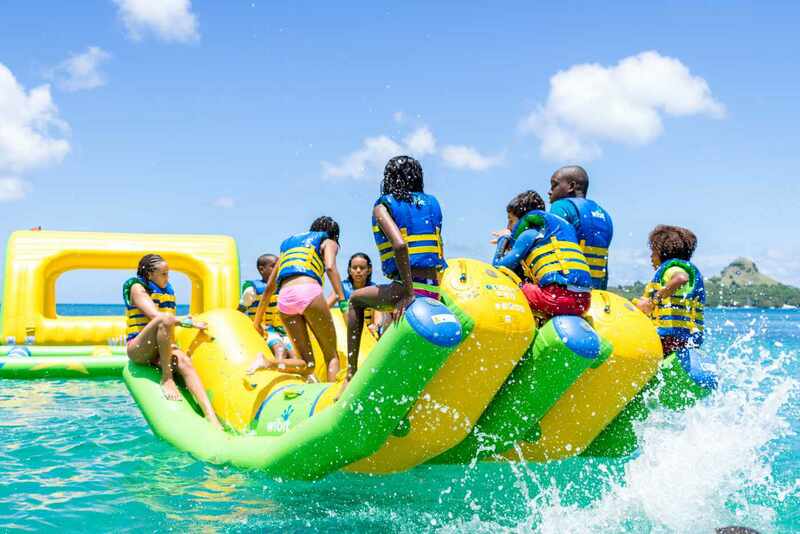 All users of the water park (who must be 6 years of age and older) will be required to wear life vests irrespective of their swimming abilities. All guests MUST sign a waiver before using the park. 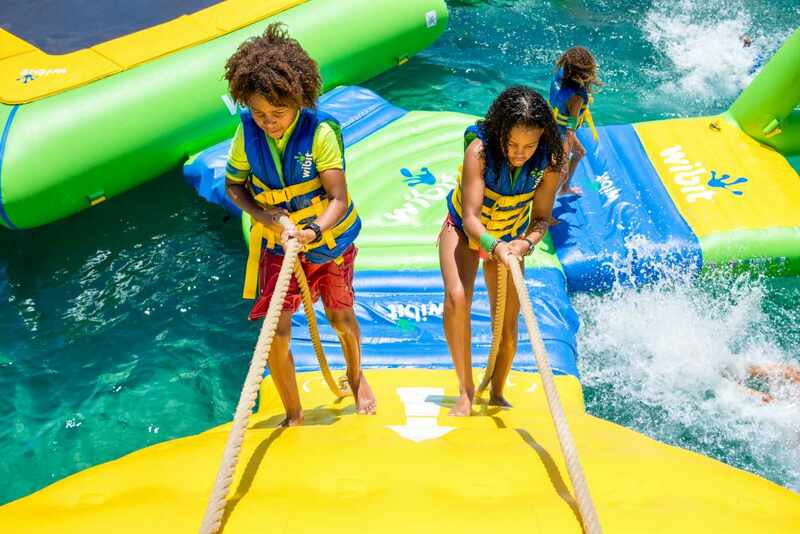 Whether it’s beach volleyball, conquering the high jump or getting all the way up to the top of the Iceberg XXL, there are more ways than ever to enjoy Splash Island Water Park. Super endroit pour les enfants et les parents ! À faire à Sainte Lucie pendant une journée relax à Reduit Beach. 6 heures comprises dans le prix de l’hôtel Bay Hotel à utiliser pendant le séjour ! The time you’re given feels way longer once you’re jumping around and trying to go through the course. It’s really a workout, so unless you have a physically active lifestyle, you’re going to be drained after. I was able to conquer everything but the concave/inverted wall, or whatever it’s called. Lool. The staff are friendly and helpful as well. When we went it was a bit quiet, so we were even allowed to stay a little bit over the time we paid for.